Most beer drinkers with half an eye open will know about the Pacific Ale style of beer, but what of a South Pacific Ale? 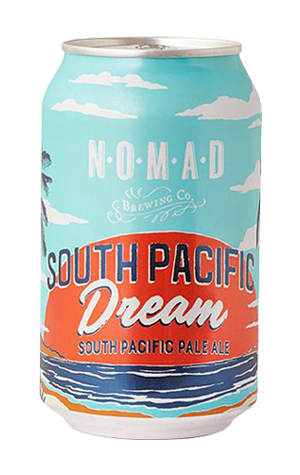 Well, there may not be a definition so Nomad has thrown a beer into the mix with their South Pacific Dream. It uses American and Australian hops so is perhaps, technically, more of a trans-Pacific Ale than one solely representing the South, but it’s really not worth getting caught up in geography and semantics because that might prevent you enjoying what’s a quite lovely quaffer. The hops in question are Citra and Mosaic which have proven time and again that they’re a winning combination, serving up bucketloads of tropical fruit character. Sat atop a fairly light malt base they make for an easy drinking beer, but one that packs in plenty on the flavour front. It is, essentially, a beach beer for those who like something light with a little extra punch.